Towing in Jackson, Mississippi - Ward's Wrecker Service, Inc.
Ward’s Wrecker Service has been Jackson, Mississippi’s premier towing company since 1964. That’s over 50 years providing our communities with quality 24-hour service 7 days a week. Our goal since our founding has never changed; to bring you reliable, fast, and affordable towing services. We understand that every call comes from a community member in their time of need. Some calls are more urgent than others, but everyone gets priority service. We’ve stayed in business this long by treating our neighbors with respect, thanking them for choosing Ward’s Wrecker Service, and providing 5-star customer service through and through. There are various reasons you may need towing or roadside assistance service, and Ward’s Wrecker Service has Jackson, Mississippi and ALL surrounding communities covered. Our service comes second to none, and at a cost that rivals any competition. We can offer you the best in price and quality because as our neighbors, we see you as more than a ticket. Your time of need isn’t our chance to price gouge you at every turn. No. We are members of the communities we serve, and the more you trust us by calling us for light, medium, heavy-duty towing, roadside assistance, and wrecker services after accidents, the better prices we can offer you. Have confidence calling us for everything towing related and more. In our efforts to bring our customers more services at the best price, we offer specialized transport with our lowboy and landoll services. Call us for commercial diesel and personal automotive repairs. We do hazmat and wreck recovery, load transfers, equipment and truck decking services. 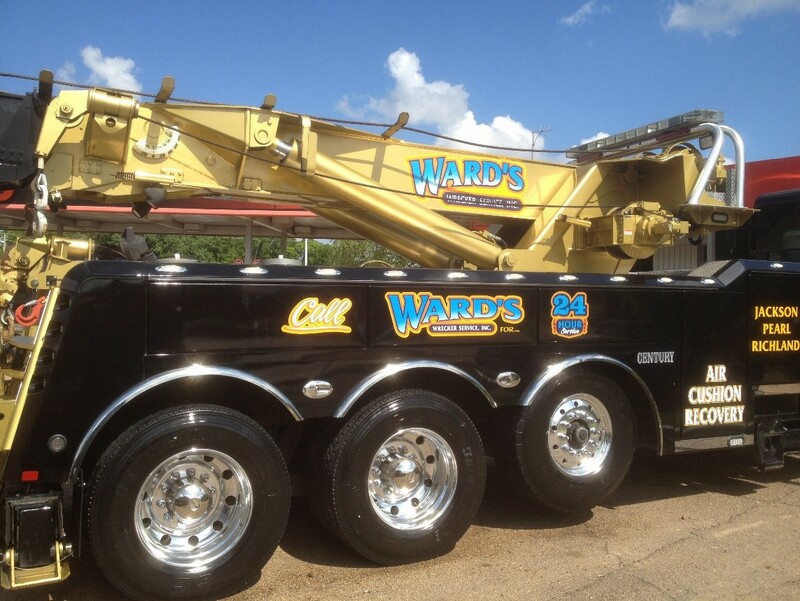 When you require heavy-duty services, Ward’s Wrecker answers the challenge with our heavy-duty rotator service. Our technicians never stop training to keep up-to-date with the latest industry techniques. We take pride in our presentation and friendliness. We put effort into maintaining our state-of-the-art equipment, keeping our vehicles and machines always ready to serve you. We aim to take care of you like members of our family. We’ve done this for over 50-years because we understand someone is at home waiting for you. They’re always waiting for you to walk through the front door. At Ward’s Wrecker Service, we don’t just want your business. We want a lasting relationship that spans generations of trust, fair dealings, and quality service at a fair price. Those values at Ward’s Wrecker Service will never change, and there is never a wrong time to call us in your time of need. 24/7 365, we are waiting for your call. As an auto wrecker, Ward’s Wrecker Service is the first respondent after a vehicular accident. We assist in the cleanup efforts of the wrecked car parts, and even the entire car itself. We help drivers just like you with personal automotive and heavy duty commercial roadside assistance and mobile mechanical services for commercial vehicles. That includes tire changes and boost-offs for vehicles of any kind, and more.